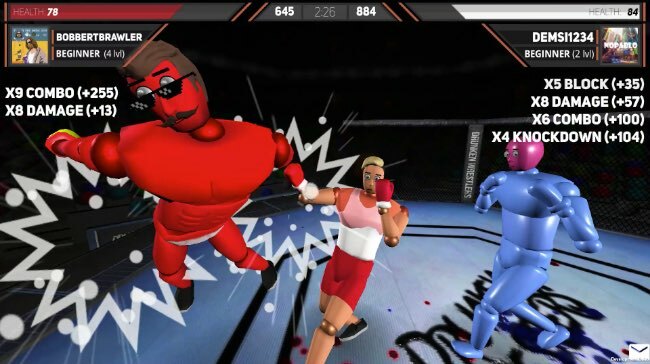 Drunken Wrestlers 2 is a multiplayer ultimate fighting game with ridiculous ragdoll physics and the ability to decapitate and rip the limbs of your opponents. In Drunken Wrestlers 2 you can customize your character then enter the ring against up to eight opponents. It may be called “Drunken Wrestlers 2”, but it’s actually more of a UFC style game with you fighting in an octagon and using the arrow keys to kick and punch your opponents with various your limbs. Your aim is to earn as many points as possible within the time limit, which you do by punching, kicking, decapitating, ripping the limbs off or killing your opponents. The physics based combat is incredibly chaotic and less a test of skill than perseverance, but it’s a lot of fun – especially when you pull off a particularly brutal blow. It’s worth pointing out that at the moment Drunken Wrestlers 2 is a bit of a buggy mess, with massive amounts of slowdown, weird glitches and a dev console that keeps popping up while you’re playing. However, despite these significant issues, it still manages to be a fun game, largely thanks to all the ridiculous on-screen carnage and chaos. It needs a lot more polish but Drunken Wrestlers 2 has a lot of potential and it’s certainly worth checking out for some multiplayer ragdoll ultimate fighting hilarity. Tips: WASD – to move, Arrow Keys to Attack, Space to Block and Left Alt to Change Target. (Changing your target is particularly important as the camera will stay locked on players even if they leave the match otherwise).